Face The Ace: Can Poker Survive Primetime? 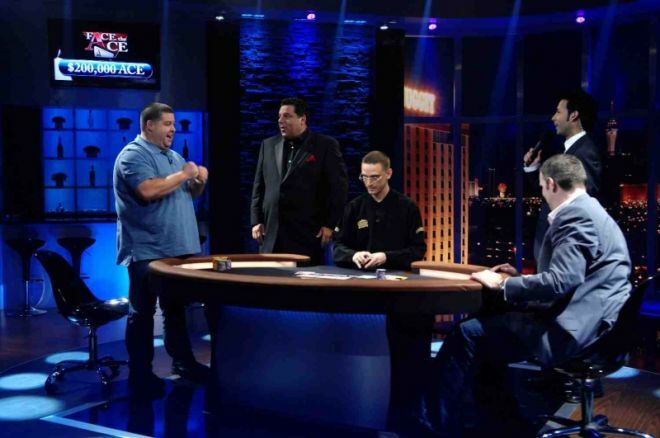 With the recent premiere of NBC’s Face the Ace and its subsequent poor ratings, PokerNews HQ has been a buzz with all sorts of chatter on whether the show will be a success or not. Face the Ace, airing Saturday nights at 9 pm EST, pins contestants, who win their way onto the show via Full Tilt Poker, against Full Tilt pros like Phil Ivey, Chris “Jesus” Ferguson, Erick Lindgren, Mike Matusow, Gus Hansen, Patrik Antonius, and more. The amateurs face off in a heads-up match against one pro and if they win they can either take $40,000 or play another pro for $200,000. If the amateur wins two matches, they can either take the $200,000 or risk it all for a million bucks by facing off against one final pro. Each match is all or nothing, creating tons of drama and stomach-in-mouth moments that will surely keep audiences on the edge of their seats. Poker television has previously missed the boat when it came to drawing big viewers, but NBC and Full Tilt Poker’s attempt to bring a Deal or No Deal style poker program to the air will pay off in spades over the long run. Poker fans have drooled over the possibility of seeing what happens when an average guy goes up against the best and this is the network’s answer. Regardless of the ratings of the show, this program is great for the sport of poker because it puts the game back in the spotlight when the World Series of Poker is not happening. This is the dream team of poker, not some random players you are watching. Yes, most people want to see someone win a million dollars, but the majority of educated poker fans are watching to see players like Phil Ivey and Patrik Antonius destroy their competition. It’s like watching one of Tyson’s earlier fights. Everyone knew the train wreck was coming and they didn’t want to miss a second of it. Fans are dying to see a player like Ivey decimate his opponent. Sure, people are going to cite low initial ratings but let’s keep in mind that this is a poker show on primetime television. It takes time to build an audience. In the end, Face the Ace is a cheap show to produce in comparison to a regular television drama, so NBC has the luxury of giving the show a shot at developing a fan base. One thing is for certain, poker players are a loyal bunch, so this show should find an audience if given the chance. What Else is There to Watch on TV on Saturday Nights? Let’s face it, Saturday night television is a black hole and it could use some spicing up. Can you name another show that runs on a Saturday night? I can’t. This means that Face the Ace could eventually outshine the competition. Let’s hope someone wins the million soon so that the show gets some publicity before NBC decides to kill it. Believe me, my hope, like anyone in the poker industry, is that Face the Ace will become a huge success. However, I think we’ll end up talking about “what could have been" instead of lauding it for the all the new players and fans it could have potentially brought into the game. In its purest sense, it seems like a clear win; poker superstars battling it out with amateurs heads-up for the chance at a million bucks. Unfortunately, these factors will keep it from reaching it’s true potential. While he may be an entertaining character, originally making a name for himself on The Sopranos, other than a small link to the illegal poker games played during the long Sopranos run, he has no connection with the game whatsoever. In the first episode, he turns quizzically to Ali Nejad for “What's happening” when players are all in. Sure, the unassuming and goofy host can be endearing, but in this case, it’d be better to turn over the hosting duties to Ali Nejad, who is both very funny as a host and very knowledgeable of the game as well. Dont get me wrong, audiences seem to love when people on game shows make the completely ridiculous choice of going for the big win rather than taking the safe money: "What’s that, there are six cases left, 5 of which are under $1,000, one is the million, and your offering up $152,000 NO DEAL." It’s one thing to make these ridiculous decisions based on pure luck, but when you mix in battling the best in the game to book big wins, it makes no sense whatsoever to continue going for it, since there is no safety net. We saw it in the debut episode when the first contestant beat Ivey. He gladly took the $40,000 instead of taking his chances that he would luck out and beat another legend. The second competitor is obviously looking to gamble and I think he is an exception to what will soon become a familiar pattern of winning one match and cashing out. Without knowing the results, I’m foreseeing disaster in the million-dollar match and a disaster other competitors will likely stay far, far away from. Ok, I get it, the pros don’t want to look silly on national TV and they do bank a win for charity by winning matches, but seriously, is Phil Ivey bringing his A+ game here? The contestants are playing for more money than some of them have made in a lifetime and the pros are playing essentially with play money chips. I don’t care how much pride is on the line; poker just isn’t poker without a significant monetary gain or loss from playing. We’ll end up seeing rather sloppy plays from the pros which sometimes will result in a nice win for the contestant, who will be deemed to have played brilliantly, and will sometimes result in a suckout that will leave the audience cringing for the poor sucker who just got two-outed on the river for $200,000 by a pro who just wasn’t completely focused on the match. Chime into the discussion yourself with comments below and if you’re really looking to prove us wrong, or right for that matter, qualify for the show by signing up for Full Tilt Poker here.